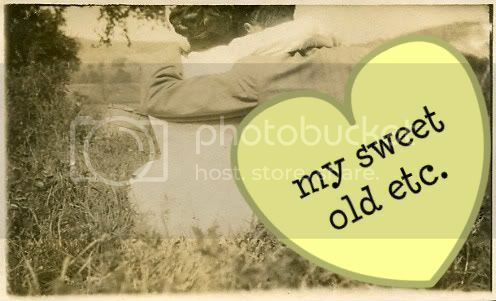 my sweet old etcetera: The Young Victoria. So I finally got around to seeing The Young Victoria last weekend with Ricky, which I quite enjoyed. You guys, I swear I belong from another time. Possibly even the Victorian era. Just something about that time in history has always appealed to me. I'm not such a hopeless romantic to turn a blind eye to the horrors women faced in this time: how easy it was to die in childbirth, how little rights you had as a woman, how uncomfortable it would be to live without today's modern amenities such as running water and electricity (the horror!!!). But I think I'd be willing to brave these discomforts just to live one day in that time. 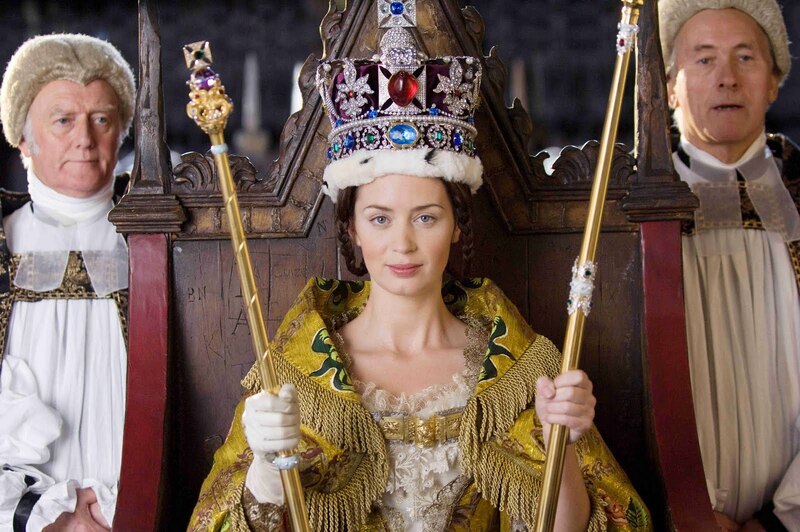 After all, Queen Victoria took the throne when she was still a teenager and she proved herself more than worthy of the task set forth before her! 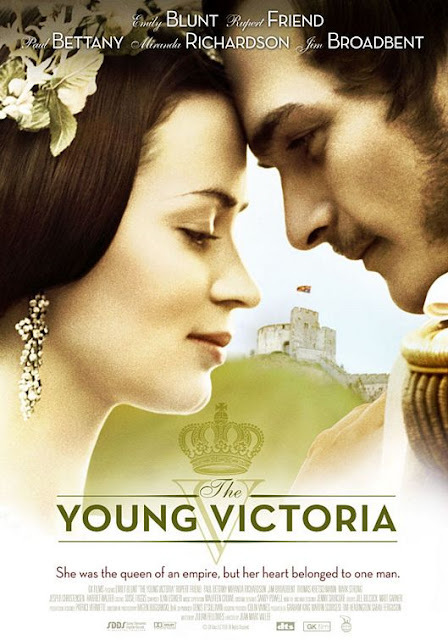 This film does a great job showing you how lonely Victoria's childhood was, how regimented her days were -- she couldn't even walk up or down the stairs without holding someone's hand, for "her own protection." No wonder she chafed at her reins and struggled to break free when the chance presented itself. The film also excels at developing the background behind Victoria and Albert's romance, which is almost fairy-tale-like in and of itself. 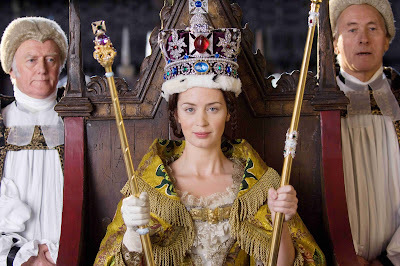 Emily Blunt, as Victoria, steps into the role with abandon, perfectly portraying the nascent queen's dual nature -- both her vulnerability and her perseverance (which often displayed itself as stubbornness). This was not an easy role, but Blunt handled it with ease. Rupert Friend, as Albert, is my new favorite discovery. Not just because he's extremely easy on the eyes, but because he proved himself to be a formidable actor in his own right, almost stealing the spotlight from Blunt in some scenes. I swooned and sighed over many a romantic moment between Albert and Victoria, and it was largely thanks to Friend's efforts. If I have any complaint about the movie, it is that the end feels a bit rushed, as if they were trying to squeeze decades of history into five minutes. But the lush scenery, costumes, and best of all, the romance is strong enough that I can almost forgive it this shortcoming. If you like historical romances, give this one a watch -- you won't be disappointed! I havent seen it, but it sounds interesting. i keep meaning to watch this film but I don't have the patience for time piece films, to be honest. i do love emily blunt and your opinion, so i'll give it a chance! I saw that movie in theaters, and adored it. The end does feel a bit rushed, but overall I was enthralled. 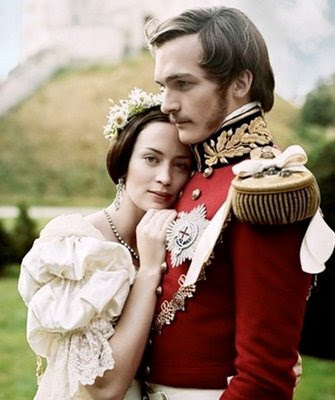 I also love the story of Victoria and Albert, since not many royal couples were actually in love. I'm ready for you, Summer! John Mulaney: "Best Meal I've Ever Had"
Wishlist Wednesday ... on a Thursday!